The days between rain and intermittent deluges are increasing in duration. My garden is thirsty, the palette is dry. I cried you a river filled with sorrows, and was healed by the joyful release. © 2017, Theresa Mae Funk. All rights reserved. taking pleasure in knowing that my quiet return has not disturbed your slumber. If my absence went unnoticed, why is it that I care? © Theresa Mae Funk, 2016. All rights reserved. The American River is the subject for my ten piece Something To Write Home About art card series. Each card is its own certificate of authenticity, and has been painted with California rain water that I’ve collected this year. Six of the ten cards already have designated addresses, and the other four will be sent to unsuspecting recipients as a Thank You note for their inspiration and continued support of my artistic endeavors. © Theresa Funk, all rights reserved. 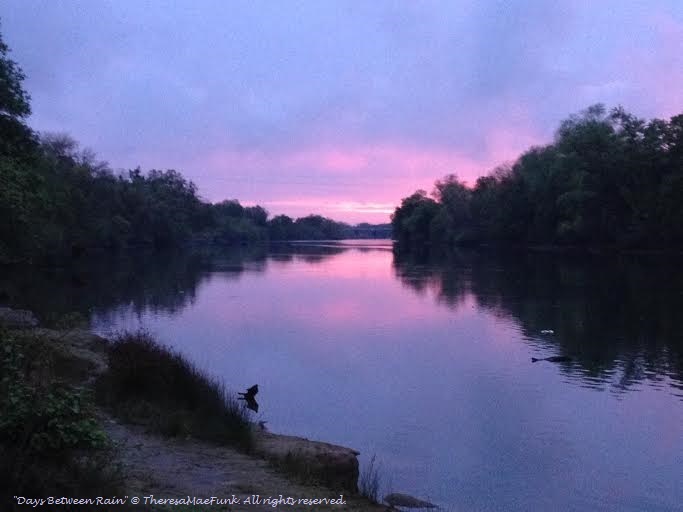 American River water is generally characterized as high quality surface water that is low in alkalinity, mineral content, and organic contamination. It is also a source of artistic inspiration for many Sacramento area artists. This moment was captured on my mobile device during a post-rain storm walk along the river, and continues to be reinterpreted as part of my Conservation Art series works on paper. © 2014, Theresa Funk, all rights reserved.